Flu sickens millions of Americans each fall and winter and leaves many people stressed about missing work or having their children miss school. Influenza, or the flu, spreads from one person to another because millions of new viruses are shed during the illness that can then infect others. Understanding when flu is contagious can help you to avoid spreading flu in your community. Flu starts being contagious about 24 hours before you have symptoms. 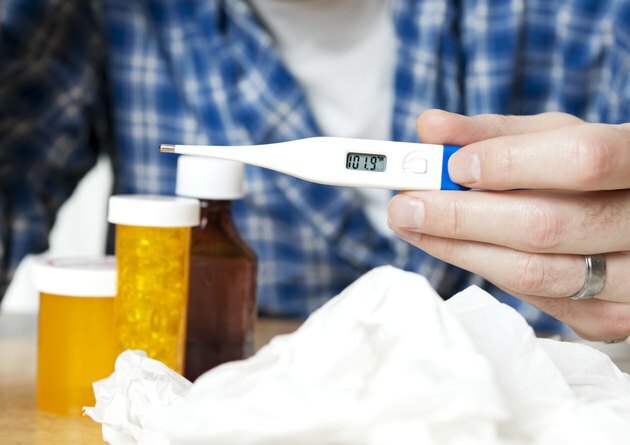 You're most contagious when you first get sick and for the following 2 to 3 days. The severity of your symptoms correlates to how many new viruses are being produced, so you're less contagious as you start to feel better. Most people stop being infectious approximately 5 to 7 days after getting sick, but you can remain contagious for as long as 10 days. To limit the spread of flu, the Centers for Disease Control and Prevention recommends staying home while you're sick and for at least 24 hours after your fever breaks. Washing your hands frequently and covering your coughs also help limit the spread of flu. People with a weakened immune system -- such as those undergoing cancer chemotherapy or living with a chronic illnesses like diabetes or HIV -- can be contagious beyond the usual 5 to 10 days and may need to avoid contact with others for a longer period. You can minimize the risk of catching and spreading the flu by getting a flu vaccine every year. If you get flu, seek medical care right away if you have difficulty breathing, chest pain, dizziness, persistent vomiting or symptoms that improve but then suddenly worsen. Mandell, Douglas and Bennett's Principles and Practice of Infectious Diseases, 8th Edition; John E. Bennett, M.D., et al.